Request: If anyone rode the old Leisureland Train and has a photo to share, please contact us. 1-306-717-1720. Thank you. Concrete Elements participated in the Saskatoon Santa Claus Parade Sunday Nov 18th, 2018. We provided the truck & trailer for the Leukemia & Lymphoma Society Float. Their theme was 'Light The Night" . It was cold but fun. Thanks to all for your support of this cause. Thank you to all of our patrons over this past year. You are much appreciated. We hope you enjoyed your visit with us. If you haven't had a chance to ride the train, come on out its warm now. Gardenscape March 29,30 &31 at the Prairieland in Saskatoon. There are some new additions to our line up . 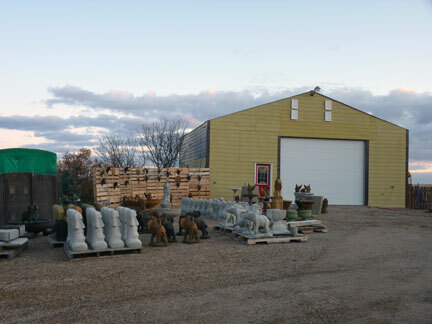 Check out the Boot Planter, 17" Turtle, new Frog Spitter, 8" balls and bases, a 3 piece obelisk and more. Come out to see our exhibit 'Four Elements of Earth', part of the "Poses" outdoor exhibition at The Hand Wave Garden Gallery located in Meacham, Sk. beginning May 8 running until Oct 15, 2018. Opening Reception is May 12, 2-5 at the Hand Wave. NEW VENUE! Concrete Elements has partnered with 'Gallery 423' in Wakaw on Hwy #2 . For those of our customers who have ridden the new "Wheatland Express' come explore this unique store. It features Saskatchewan made items such as leather purses, CD's, pottery, paintings, woodworks, ice cream and lattes.Concrete Elements has added another dimension with a sampling of statuary, benches, fountains, and other "must haves". Welcome to the home of Concrete Elements Ornaments by the Yard Where Your Visions Become Concrete. Come browse around to get some inspirations and ideas. All of our statuary is re-inforced with fibre mesh for added strength and durability. We will do custom colouring also if requested.